You can help the Burn Center today by making a one-time donation, creating a fundraising page, or starting a team. The funds you raise can help provide equipment, educational materials, and professional development for the Burn Team caregivers. 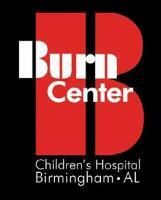 Each year more than 170 children from all over Alabama and bordering communities are admitted to the Burn Center at Children’s of Alabama. The Burn Center is a 6-bed unit supported by a team of professionals that includes surgeons, nurses, physical and occupational therapists, nutritionists, social workers, child life counselors and teachers, and chaplains. The center is recognized nationally for providing excellent care for traumatically burned children. The average hospital stay of a severely burned child is over 7 days, significantly longer than most other types of pediatric hospital stays.